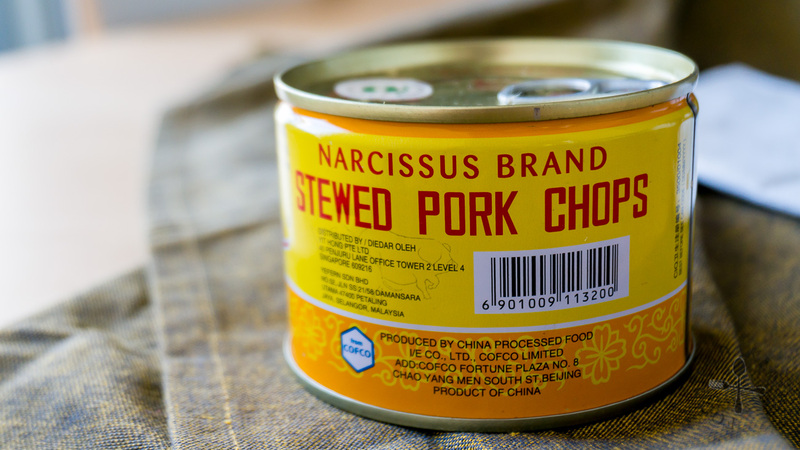 I would say that Narcissus is a relatively popular brand in Singapore specialising in canned food (not sure about the brand’s popularity in other countries though), such as mushrooms, braised peanuts, and a variety of braised/stewed meats. My mom will always buy this particular Stewed Pork Chops 红烧排骨 (photo below) when making her fried bee hoon. Even though the can labels “pork chops”, it’s more like pork ribs because that’s what we get inside. 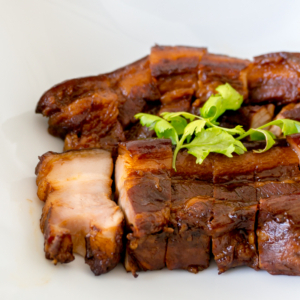 In fact, the Chinese words labeled it as pork ribs (排骨), so I guess it’s a mistranslation that has not been corrected for many years. 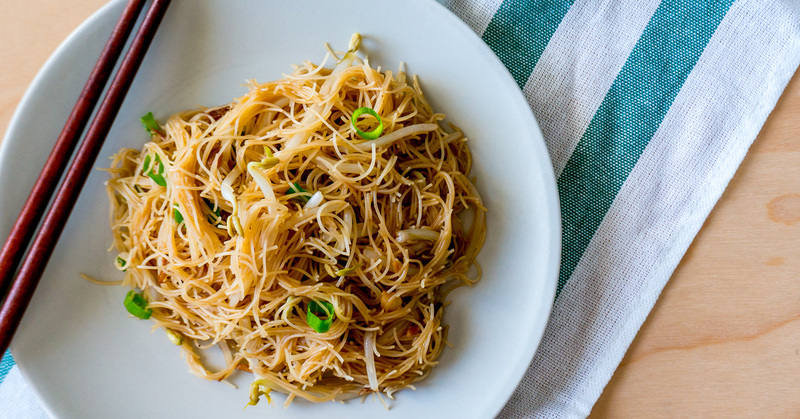 To make this incredibly quick, easy and delicious dish, the bee hoon is first soaked until soft in warm water (which hasten the soaking time). My mom uses this particular brand of rice vermicelli (Chilli Brand Rice Vermicelli) but I couldn’t get it overseas so I just use a thin variety that I got from the Asian supermarket. For the can of stewed pork, the meat is separated from the sauce in the can (the bones are discarded). The sauce is liquid gold so don’t throw it away! 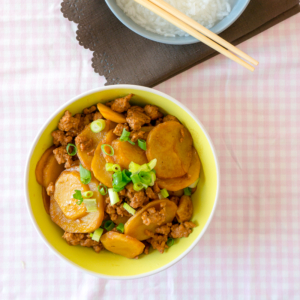 The bee hoon will readily soak up the sauce while stir-frying, making it incredibly delicious. My mom uses only bean sprouts in her fried bee hoon so I’ve done the same here, but feel free to swap or add other vegetables like carrot, or cabbage, but do note that you will have to cook these vegetables first (so it will take longer). Another note on bean sprouts – growing up, I’m used to removing the tails of the bean sprouts before cooking them (though I don’t really care whether the vendors do that when I eat out), so I picked off the tails of my bean sprouts here. You don’t have to do it if you are comfortable with eating the bean sprouts tails, it’s just a habit for me. 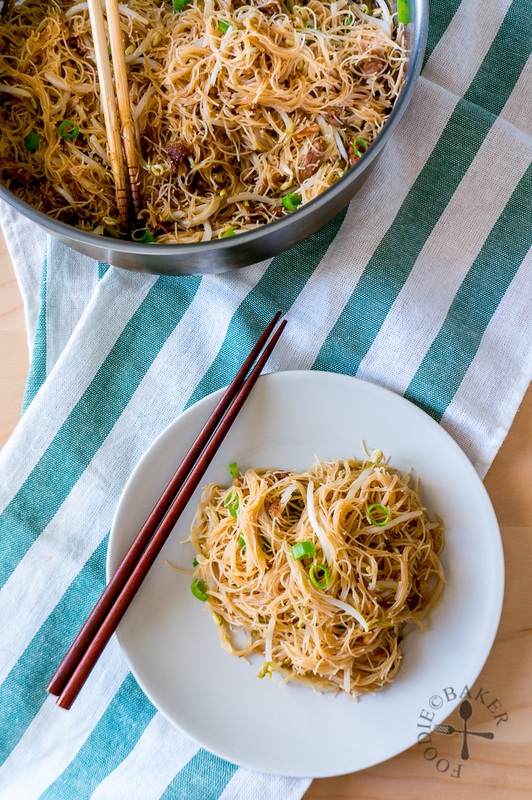 Putting this fried bee hoon dish together takes only about 15 minutes, so make sure you have all the ingredients and equipment ready before you start cooking! Check out how it’s made below! 1) Soak bee hoon in warm water for 15 minutes, until softened. Drain well and thoroughly. 2) Remove the meat from the can and discard the bones. 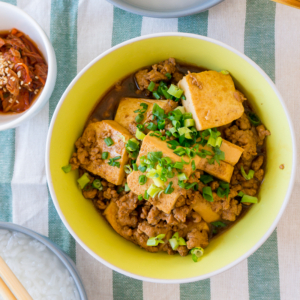 Shred the meat into small pieces. Reserve the sauce in the can. 3) Cook garlic in oil until it turns golden-brown, about 5 minutes. 4) Working quickly, add in pork, bee hoon, light soy sauce, dark soy sauce and half of the sauce. Toss well then add in bean sprouts and remaining sauce. Cover and cook for 3 to 5 minutes. And it’s time to dig in! I always go for a second serving of bee hoon without fail! 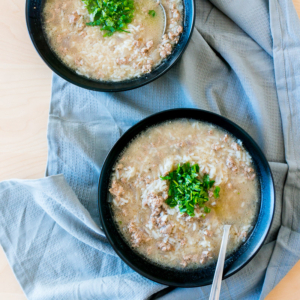 And here are some of my mom’s other quick and easy recipes – they are all my favourites! Soak bee hoon in warm water for 15 minutes, until softened. Drain well and thoroughly in a sieve/colander and set aside. Remove the meat from the can and discard the bones. Shred the meat into small pieces. Reserve the sauce in the can. Heat a large wok / deep frying pan over medium heat. Add in oil and garlic. Cook gently until the garlic turns golden-brown, about 5 minutes. Working quickly, add in pork, bee hoon, light soy sauce, dark soy sauce and half of the sauce in the can. Using chopsticks or tongs, toss well to distribute the seasoning evenly. Stir in the bean sprouts and the remaining sauce. 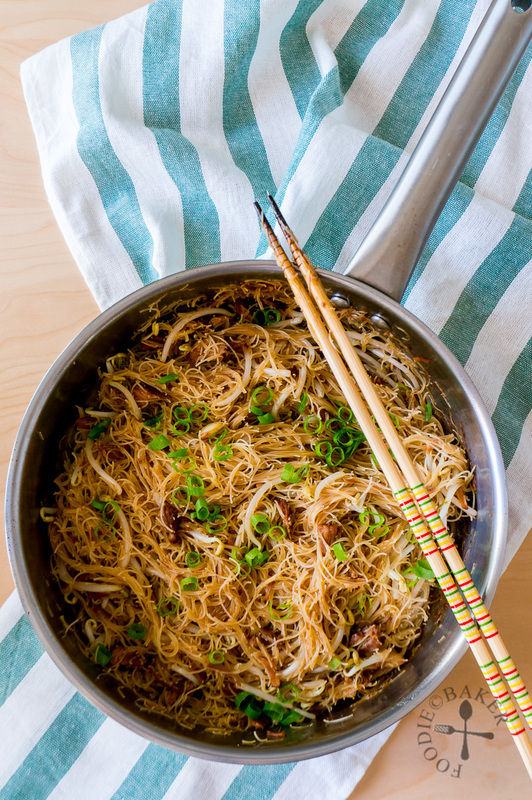 Cover the pan with a lid and cook for 3 to 5 minutes, tossing every minute and adding in just enough of water to moisten the bee hoon if the pan is drying out, until the bean sprouts have softened (but still crunchy) and the bee hoon is cooked through. Garnish with spring onion and coriander and serve. - Make sure you have all the ingredients ready before you start cooking! Hi, thanks for the recipe. But what to do with the remaining half of sauce in the can, and the pork itself? Is the pork in the can pre-cooked? 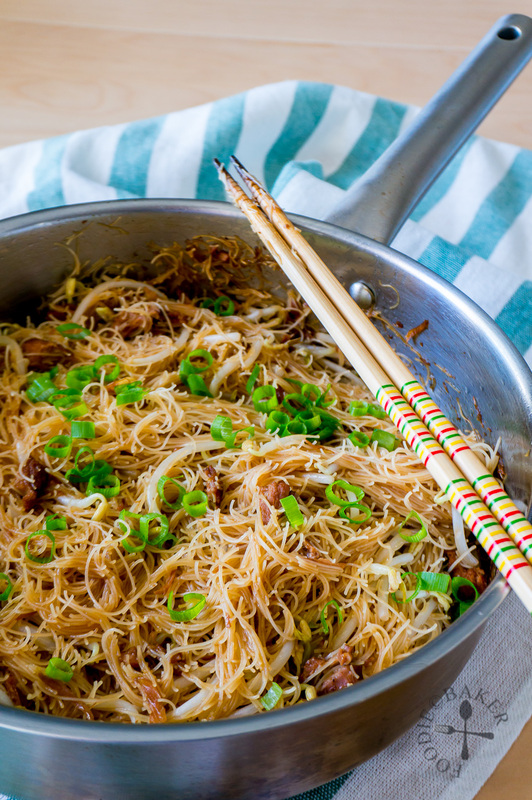 You just reminded me that I have not had bee hoon for ages…I am loving your mom’s recipe…simple and yes, so tasty! Thank you so much Juliana! Stir-frying bee hoon is one of my favourites 🙂 Have a great week ahead, take care! Hi Emma, thank you so much for visiting and I hope you managed to find this tinned pork! Have a great weekend ahead! Looks and sounds like a dish that would go down an absolute treat in my household. Fingers crossed I can find the correct ingredients. Yum! Seriously yum. Haha I know right, it’s such a cheater-bug food! :p I hope you can get your hands on this can of pork chops!